I’m trying something new this year: my students are reading every day. Last year I reserved Friday for independent reading. Students did okay with that, but few read as much as I had hoped they would. This year I dedicate the first 10 minutes of every class to silent reading. We’ve been in school a month, and I have many students who have finished a book–some have finished three and four. The first week of school I set the expectation, and I talked about books a lot. Every day I introduced a book and its characters to my students. I read passages and book covers. I testified to the importance of a book in my life. I read reviews and showed book trailers. I worked at getting a book in every single student’s hand. And it’s paying off. Ever is that one student. You know the one. He grabs the first book off the shelf and pretends to read it. He does this every day for a week. You know he’s a Fake Reader. You’re just waiting for the right time to talk with him about it. Then one day he leaves The Invisible Man by H. G. Wells in the classroom–you know he’s not reading this book anyway. What normal sophomore would? So you hide it just to see what book he’ll choose to Fake Read next. He doesn’t. He sits. And does nothing. Finally, you make your way to talk with Ever. “What’s up with this Fake Reading?” you ask. He mumbles something that you don’t understand. “If you tell me what you’re interested in, I can help you find a book,” you offer. He shrugs but walks to the bookshelves, soon returning to his seat with a bright non-fiction paperback. You don’t see the title, but you watch to see if Ever’s reading. Nope. He’s an Advanced Fake Reader. Then he surprises you. He asks for help finding something real and historical, so you offer a stack of memoirs with authors from Cambodia, Iran, and South Africa. He doesn’t even bother to pick them up, but he’s drawn to the shelf they came from. You can see it in his eyes. You’re pushing but not too hard. You barely know this child, and you know the first three weeks can make or break the relationship with a student for the whole year. Then you see him. He’s got a thin book–historical fiction. And he’s reading. He’s really reading Once by Morris Gleitzman. The next day Ever is one of the first students in class. You glance over, and Ever is reading, and the bell hasn’t even sounded yet. You walk over to offer a bit of praise. “Hey, Miss, I’ve read 120 pages since yesterday!” he tells you. And inside you’re grinning so widely your cheeks hurt. Ever finishes that book the next day and reaches for Then. Then You know you’ve got him when he turns the pages in Now. And maybe, just maybe you’ve converted the Fake Reader. How do you get your Fake Readers to give a book a try? Oh, Gary, I know! I only have one copy of the Dahmer book. If I had five, I think I’d have students reading it. Thanks for the comment. “Kid watching” — I love that. Thanks, Mindi. Graphic novels are usually a pretty good way in. The hot one with my students this year is My Friend Dahmer by Derf Backderf. Yay! You hooked him. Your post illustrates the importance of kid watching! What an awesome story! 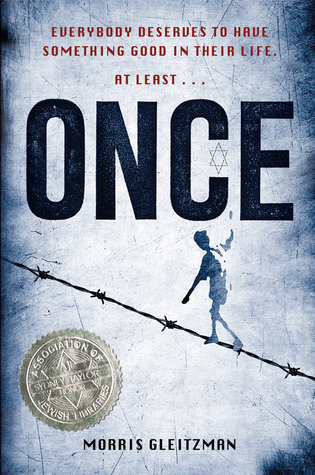 Once is such an incredible story!